So, I'm willing to bet most of you don't know a single thing about me. That's cool. Good time to learn. I'm a gambling man. Have been my whole life. I look for trends and patterns and see if I can manipulate circumstances in my favor. Not really for financial gain, more so for the sport of it. I like to see if I can correctly predict events based on clues and prior knowledge. One thing I'm certain of is that our lovely lady, Vraska, will be joining the Gatewatch. I speculated this in the past during RIX when Jace memory wiped her after learning of Bolas' plans. You see, when Jace learned of Bolas' plans to invade Ravnica back in HOU, he knew something was up. When he later learned that Vraska was involved after they had made their truce and found The Immortal Sun, he wiped her mind so that she could continue on their mission unhindered. It only makes sense that, lore-wise, when she returns to Ravnica - if Bolas were to attempt and contact her (Which, why wouldn't he?) he'd want to know if she ran into Jace. If Jace wiped her memory of all traces of himself, Bolas would see that she has no memory of him. If Bolas sees Vraska does not remember Jace, but he put Jace there, he'd know Jace did something to her. It's not that hard for him to make the leap in logic that she betrayed him in some way. With Nissa leaving the Gatewatch, and Liliana also walking away, this leaves us a void in both and . A perfect situation for Vraska to fill. This would also give us an Oath that could potentially do some sort of Graveyard manipulation, which we are currently lacking. I also correctly predicted that we'd see both a blue and a black dinosaur in RIX. That was a personal bet I made with some people at work. In addition to these, I made the prediction long before anything was announced for Commander 2018 that we'd be seeing wedge/shard decks. I based this on the fact that they had announced Planeswalkers as Commanders in a spoiler block on their website, but only mentioned 4 decks. Pitting four guild decks against one-another would feel unbalanced, so I predicted that they'd have to almost certainly be 3C minimum. Turns out, I was 3/4ths of the way right. In addition to these, I've made nearly a grand in preordering singles and selling them after they spike by paying attention to meta shifts in Standard. I also do gambling outside of MTG, where I've made a decent amount of side income for a while. I also correctly predicted that Teferi would not only regain his Spark in DOM, but that he'd be Azorius in nature. I based this on his ability to manipulate time, among other factors. I was met with quite a bit of backlash, not just when I mentioned here on this site, but on other sites as well. Though I did also predict that Jhoira would be seen as a Planeswalker and she was not. :/ Oh well, can't always be right. Side Note: I don't know if we'd ever set foot on Vyrn, Jace's homeworld, but I'd definitely love to go there. I hope we do in the future. SOOOOO... what's this got to do with an Aurelia Planeswalker?? 1.) It's a full-art frontal view of a centered main character. 2.) The main bulk of the artwork falls within card frame, with the type text hitting about at her belt. 3.) 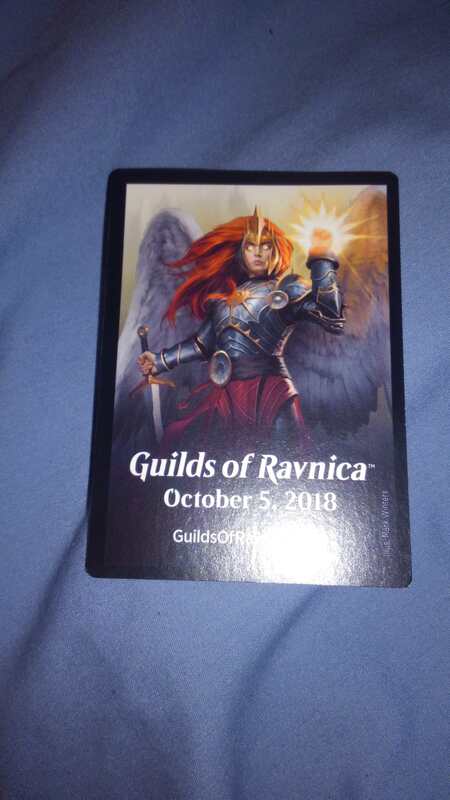 The darkened area under where the card's Guilds of Ravnica text sits would be where loyalty text is. Blackening it out now makes sense for promotional reasons, but it goes to show that text fits within this area. 4.) This is clearly commissioned artwork. Token promotional artwork has always been shown on cards in the past. It makes no sense for them to buy this artwork and not use it. 5.) If this artwork was bought, it stands to reason it is meant for a properly designed card. It makes no sense for the artwork of this design to be used on anything other then a Creature or a Planeswalker. But given that the size, aspect ratio, and centering focus primarily on her upper torso and face, it makes no sense for it to be a creature we've already seen. Therefore, this artwork MUST belong to a Planeswalker. Boros is known for being a weak color, and it makes sense from an R&D perspective to ramp it up with us stepping into a Plane where Boros is one of 10 Guilds. They need the Guilds to be balanced, so beefing one of the weaker ones with a Planeswalker is a powerful push. It also makes sense from a lore perspective, because she's already so damn powerful. If she is true to her Boros nature, she'd be the first one to charge directly into battle should Bolas' conflict hit. If she were to be met with a near-death experience, that would ignite her spark and ascend her into a Planeswalker. It ALSO makes sense to introduce her early, so we have a full set of play with her rather then a half-set. Considering Guilds of Ravnica is featuring Boros as one of the five Guilds, I could see her ascending toward the end, but we'd have an entire six months to play and build decks around her as the meta shifts. Now, you might be tempted to argue that we just got a Boros Planeswalker in the ways of Huatli, and you'd be partially right if not for the fact she's Naya. But I see your point. 1.) Ixalan and Rivals will be rotating out soon. This means she drops off the map. 2.) Hautli, Dinosaur Knight was a Tribal Planeswalker not fit for really any meta. 3.) Hautli, Warrior Poet is laughably underpowered. Gaining life does not protect her as your opponent can just target her. Her 0 ability does protect her, but does not progress her. And her -X ability takes so painfully long to be of any significant use that by then you should already be setting up a win condition. There are cheaper, better board wipes to spend your time and resources on. So I speculate we will get Aurelia as a Boros Planeswalker, and she's going to be what puts Boros on the map for Guilds of Ravnica. I doubt we'll get a Planeswalker deck for her. Probably just the single you can go out and buy, but nevertheless that's my prediction. Take it or leave it, but I think I made a solid case. Huh. I actually did link Huatli, Dinosaur Knight and Huatli, Warrior Poet. When I went back into edit, the brackets are still there. Must be a bug with it being indented. Weird. Oh well. OOOH, I see. I misspelled their names. Weird that it didn't make the error pop-up. Huh. August 6, 2018 4:09 a.m. I like it :) , seems resonable. Think of it... angel planeswalker could even have a gideon esc ability which makes her a 4/4 Legendary Angel with flying, Vigilance and maybe indestructible (if you wanna max it like gideon). August 6, 2018 5:07 a.m. In truth... This is actually decent theorizing. Especially when you consider the fact that legendary creatures tend to be action shots. One of the guilds will have some weak connection to tribal subtheme due to cards from Ixalan and Dominaria being in standard and wizards slowly weaning off tribal effects. Reprints of at guildgates but not shocklands (unfortunately) due to the current standard. A Thrull (Orzhov), Homunculus (Dimir), Weird (Izzet) or Insect (Golgari) legendary based on the fact that Wizards are more willing to create creatures based on less used creature types recently. August 6, 2018 5:08 a.m. It's unlikely Aurelia will become a planeswalker. For one, while what we can see of this art does appear to fit the aspect ratio of a planeswalker card well, it may not be the whole art. Many card arts are much bigger than what gets cropped and put into the frame. And with Aurelia being so important, its even possible that her art might be the store champion/game day mat design. Many Legendary Creatures are in action shots, but its not a rule. Even Aurelia, the Warleader is just sorta floating there. Secondly, and this is key to the lore aspect: Angels can't be born with sparks. Angels are pure manifestations of mana on nearly every plane, Ravnica included. They don't count as normal life forms, despite their sentience. Theoretically, like Karn, she could be given another planeswalker's spark, but that would be unlikely to happen here and now, at the beginning of a three-set visit to Ravnica with no major characters in a position where they need to or would be willing to sacrifice their spark for her. August 6, 2018 8:12 a.m.
As probably the biggest Boros fan on the site, I say HELL YES. Not sure if it makes sense from a lore perspective, but I care about how cards fit into my decks, not how characters fit into the story. I'm hoping for some Boros EDH support. Whether insane legendaries or some way to consistently draw and ramp in RW. I hope WotC will make it a point to do that for all us Legionaries in EDH. I predict Bounce lands reprints. August 6, 2018 9:16 a.m. Anyway this post has gotten me very excited, can't wait to return to Rav and see what Aurelia has been up to. August 6, 2018 9:30 a.m.
Ixalan and Rivals of Ixalan rotate out next year, so both Huatli's have another year in standard. That being said, they are underpowered, so another Boros planeswalker could happen. August 6, 2018 9:37 a.m. So I think there could be a boros walker but more likely some combo of those colors. We won’t be losing ixalan and rivals soon, only kaladesh through hour of dev. We will be losing saheeli, dovin, Chandra, Lili, Gideon, Ajani, tezzeret, Samut, a Bolas, and 2 nissa walkers (not including the walker deck cards). In total we lose a total of 2.3Red, 1.5White, 1.8Blue, 2.5Green, and 1.8Black. So assuming we get another vraska, that leaves us with in red and blue having the largest gaps. But green and white right there, so I see us getting Vraska for G/B, Ral for Izzet filling the U/R hole, and a replacement W/G Ajani maybe for the remaining colors? If Boros did get a walker it would have to be a new character as Aurelia is an angel and can’t have a spark. August 6, 2018 9:50 a.m. Edited. August 6, 2018 11:38 a.m. If Karn got a spark, then I see no reason am angel can't be gifted one. Just not a natural occurrence. But with Niv-miz looking to increase his power and him learning about the walkers, it's not a stretch that he could try to experiment on transferring a walker's spark into himself. And being an intelligent dragon, he would try to put the spark into something besides himself. So I don't see an angel Walker as outside the realm of reality. August 6, 2018 12:11 p.m.
seshiro_of_the_orochi, it looks like she's just doing the Boros symbol. "Oath" art has hand open, thumb out and perpendicular to the other fingers. The problem with Aurelia getting a spark is that someone needs to lose theirs. Karn only has a spark because he gained the sparks of Urza and Venser. pskinn01, I agree that Niv would put a spark in someone else as a test, but I would think capturing Aurelia and putting a spark in here would be too risky. If anything, he would try to put a spark in someone loyal to him, not someone who would potentially take the spark and run. August 6, 2018 1:59 p.m. The other issue with comparing Karn and Aurelia in these cases is the fact that pre-mending planeswalkers could literally do anything. Vensor and Karn were both pre-mending planeswalkers, and Vensor gave him the spark premending. After the mending, it's questionable if you're able to transfer Sparks. August 6, 2018 4:11 p.m. I thought Venser gave Karn his spark post-mending. August 6, 2018 4:19 p.m.
Karn got Venser's spark post-mending, yes. The question isn't whether it's possible, it's which established, developed, multifaceted character are we going to sacrifice for a semi-popular angel--in the first set of three on Ravnica, when no major dangers have arisen yet? As a finale to Bolas' invasion, maybe. But not yet, and certainly not from our current cast of characters to her. August 6, 2018 10:02 p.m.
August 7, 2018 9:03 a.m.